Herders are reaping the grass with reaping machines. 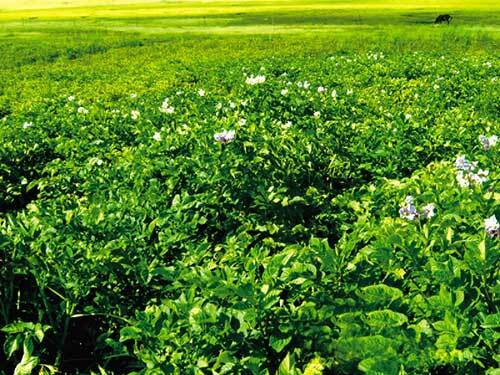 Photatoes growing in Pangda grassland. In spring, setting off from Pangda Airport (the highest airport in the world) we drove about 10 km along Trame riverbank on national road No.214 and soon reached Trame Village of Pashod County. The Pangda grassland, at this time, still looked withered and yellow. The sky was azure blue; yaks and flocks of sheep were calmly grazing on the grassland; at times, groups of Tibetan antelopes also scurried across the grassland. Guided by Dargye, the village's chief administrator, we visited around his glass house, the livestock pens and haystacks piled up like small hills. Dargye talked all about his life to us, and the contentment and happiness showed in his face. At noon, Dargye's wife cooked lunch for us. While chanting, the generous herder brought us dishes with green pepper fried with yak meat, well-cooked potato slices, vegetable soup and rice. We were told that all vegetables were actually picked from his glass house. Dargye said that just several years before, his family could only purchase vegetables from the markets of the County's downtown, 200 km far away. Therefore, there was hardly a vegetable dish on the table when the New Year or holidays came; but the situation has changed now. With the support of the government, every household has built a glass house-fresh vegetables for the herders' table. With the success of planting potatoes, the quality of life for herders has changed dramatically. In the wake of their improvement in living standard, the herdsmen and their families living in Pangda (over 4300 meters above sea level) have changed their lifestyles and their outlook on life. 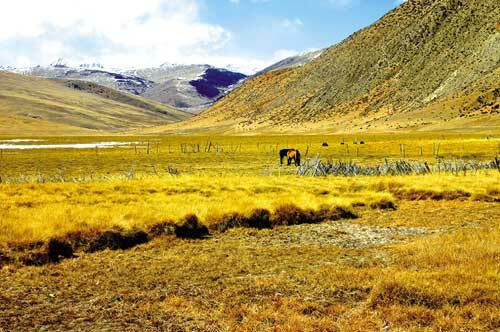 The extensive grassland in Pangda is sustained by an ample water resource, becoming a rare and incomparable nomadic area in Henduan Mountain ranges. On the grassland, covering an area of 3500 sq. metres, there are four towns in Pashod County: Pangda, Kyidrong, Yichen, and Khotchen, with 36 villages and 10,822 herdsmen. These people have lived here through a time in which the grassland has degenerated and conflicts have grown between livestock and grass supply that has seriously and negatively impacted on and constrained the healthy development of local animal husbandry. Since 2002, Pashod County has selected 1000 mu(about 67 ha.) of inferior grassland in Trame Village to conduct a pilot program of hand-planting grass, which has brought about a new spring to the grassland. The perception of herders has changed from "I was asked to plant grass and raise livestock" to "I want to cultivate grass on my land and raise livestock". The plentiful grass was not only used to feed local livestock, but also to sell to outsiders in tandem with solving the conflicts between feeding livestock and the grass supply. The growth of livestock has clearly been improved while the mortality rate of livestock has dropped drastically. The herders' income is soaring and their living standard has improved remarkably. In addition, through adopting the strategy of hand-planting grass and nursing livestock, herders have successfully sold out in winter. "Looking at those haystacks, small and big, and you will get an idea how big a harvest of grass has already happened in my family. All of those are enough to feed all 300 of my yaks", said Dargye in confident response when the author asked him. Except for the grass-planting program, Trame Village was also on the way to experience a 200 mu(13 ha.) potato-planting program, and the output per mu reached 2000 kg. What a great success! In 2006, the per capita income of villagers in Trame village reached 3000 Yuan. Every household had already purchased a tractor, a motorcycle, and new furniture... and some of them have built new houses. In Dargye's yard, the dried yak and sheep meat were hanging everywhere; items like grass cutters, motorcycles, and tractors, were the fashion in nomadic areas and very attractive to herdsmen. Dargye was no exception and those items were stacked inside his yard. Various kinds of family apparatus, from soup to nuts, were fully evident everywhere in the main room, and it seemed his family was a particularly affluent one in the nomadic area. Through Gyatso Rinchen, the director of Agriculture and Animal Husbandry Bureau of Pashod County, we got to know that the government, in recent years, was exercising the settle-down project for herdsmen. Totally, 38 householders in Trame Village have already settled down in one place. Considering the sustainable development, most of places in Pangda embarked on the grass-planting program, which made about 3000 kg of hay per mu. 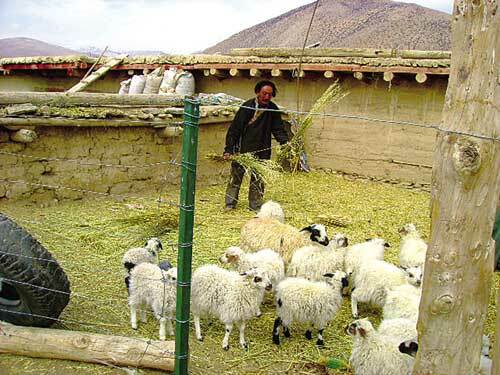 By taking such strategies as grass-planting, scientific breeding of livestock and cultivation of vegetables, herders' attitudes have changed dramatically, so have their living styles. Such changes were actually attributed to the significant achievements of these strategies. In 2006, the County's Financial and Planning Bureau took out 200 thousand Yuan from its tight pocket to support several towns in Pangda grassland in the grass-planting program. After this, the expansion of the pilot program produced more beneficiaries. Totally, herdsmen cultivated 1277 mu(85 ha.) of land over several areas and then sowed it with grass, such as at Drago Village, Sorada Village, and Kyildrong Town. From the selection and preparations at the very beginning of this program to the cultivation of the land, many professional staff and administrators from the Bureau of Agriculture and Animal Husbandry of the County worked with the herdsmen day and night in order to make success of the grass-planting program. The villagers are very enthusiastic and love this program very much. Meanwhile, several training classes were organized so that the villagers could learn technological skills regarding the cultivation of grass. Dargye is feeding sheep in a pen. Landscape of Pangda grassland in winter.Having been hand-planted for several years,the grass in Pangda grassland prospers. 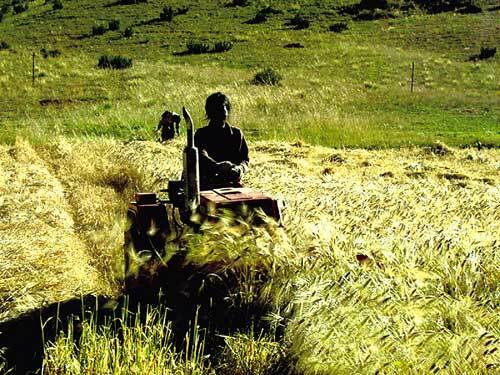 The success of the pilot program in Trame Village enables the expansion of grass cultivation to all peripheral areas. In this year, Chamdo is going to expand the program by covering 10,000 mu(667 ha.) in order finally bring benefits to most local people. Such initiatives of the government are acknowledged as a prerequisite to develop modern animal husbandry, increase the income of the people and improve the living standard of the herdsmen. "We appreciate what the government has done for us. It is just the program of grass cultivation and scientific raising livestock which has enabled us to increase our herds at exactly the right season to sell them. Even during the season which in past has had a high mortality rate, there are still plenty of fat livestock suitable to sell. That is because favorable policies provided by the state made our incomes soar. Because of that, we have extra money to build houses, buy furniture, tractors and motorcycles. Our lives become better and better", said Dargye with a smile.